The final struggle 2014 sq. 01.01. Greece takes over the six-month EU presidency. 04.05. 11 months after the closure of ERT, a new Greek public broadcaster (New Greek Radio, Internet and TV) begins its activities. 14.05. In a statement, Theodorakis repeats what he has already said on May 9: He will not support any party and is not a candidate in the European elections of 25 May. 18. & 25.05. As a result of Municipal and regional elections, SYRIZA conquers for the first time in its history Attica and the Ionian Islands. 25.05. SYRIZA, led by Alexis Tsipras, triumphs the same day in European elections with 6 seats, including one for Manolis Glezos, (ND: 3 seats). 11.10. Antonis Samaras wins a vote of confidence (by 155 votes against 131). 27.11. Greek unions proclaim a general strike to protest against the austerity measures of the government. This strike paralyzes the health sector, education and transports. 02.12. Greek anarchists set fire to a public bus and several vehicles during clashes with police in Athens, on the occasion of a sympathy meeting for a prisoner, Nikos Romanos, who is in hunger strike. 08.12. The budget for 2015 is accepted by 155 votes for and 134 against. Samaras decides to advance to December 2014 the presidential election scheduled for March 2015. This election is at high risk, given that Parliament must elect the President at last in a third round, otherwise new legislative elections are to be held: "A shocking liar poker game that disorients the Greeks," notes French newspaper Le Monde. 29.12. Stavros Dimas, as the candidate of ND and as a former European Commissioner, fails to become President of the Republic in the third round, and so Parliament is dissolved, as required by the Constitution: These elections started on 17. Early parliamentary elections are now set to 25 January. 1,000,000 job losses, 30% closed companies, 38% decrease in wages, 45% reduction in pensions, 25% decrease of GDP, 30% of low household income; 42.8% increase in infant mortality, 190.5% increase in unemployment - this hits 30% of the working population and 60% of young people - 272.7% increase of the rates of depression, 35.5% increase in the public debt, 84.3% reduction in construction activity ... and on average 2 people suicide every day. End 2014, gross public debt is 177.10% of GDP. For France it is 95%, for Germany 74.7%. Thus, the two major "lecturers" do not meet the Maastricht criteria. They never have. Greece's debt is now for 80% owned by public entities. These are, in order, the European Financial Stability Facility (EFSF), which meanwhile has become the European Stability Mechanism (ESM), the European States, IMF and ECB. 03.01. Former Greek Prime Minister George Papandreou announces the foundation of a new party (Movement of Democratic Socialists - Κίνημα Δημοκρατών Σοσιαλιστών) which will participate in the next elections. 25.01. Elections bring to power the anti-austerity leftist party SYRIZA which triumphed with 36.34% of the votes and 149 deputies out of 300. This vote is a stinging disavowal of ND (minus 53 seats) as well as for PASOK (minus 20 seats). Papandreou's party doesn't even enter Parliament. 26.01. Alexis Tsipras manages to form a coalition with the right-wing Independent and sovereigntist Greeks (AN.EL.) and is appointed Prime Minister. He is the first head of government in the history of Greece who refuses to swear on the Bible and before a pope. 26.01. While commending SYRIZA Theodorakis recalls: "We must not forget that the Greek people in its majority expects that a complete change of system is in compliance with the explicit commitments and election promises, especially by SYRIZA but also by AN.EL that provide an end to the Memoranda, an end of the Troika policy, an end of the unbearable pressure coming from outside. This is essentially why members of SYRIZA have gathered around them so many voters who are against Memoranda oand those political parties that have ruled Greece since 2010." 27.01. Swearing in of the new government: Prime Minister Alexis Tsipras, Deputy Prime Giannis Dragasakis. Yanis Varoufakis becomes Finance Minister, while Panos Kammenos of AN.EL. is Defense Minister. 30.01. Alexis Tsipras and Yanis Varoufakis have interviews with the Dutch head of the Eurogroup Jeroen Dijsselbloem and say that they refuse to cooperate anymore with the Troika (Eurogroup, IMF and ECB). Instead, they demand direct talks with other European countries. 31.01. Mikis Theodorakis qualifies this attitude as a "moment of national pride." 18.02. Prokopis Pavlopoulos is elected by the Greek Parliament President of the Hellenic Republic with 233 votes against 30 for Nikos Alivizatos. 19.02. Greece is asking its partners in the Eurozone to expand a 6 month loan deal. Germany rejects the request. 20.02. The Greek government and the Eurogroup reach an agreement in principle to the extension by 4 months of the loan agreement. 23.02. Theodorakis: "Say NO to Schäuble NEIN!" 24.02. Alexis Tsipras visits Theodorakis at home. The same day, Greece presents to the Commission a list of 11 reforms to extend the loan agreement. 26.02. In a letter Theodorakis is criticizing the SYRIZA-ANEL government and calling the people to join an anti-memorandum rally organized by the Communist Party of Greece (KKE) on Feb. 27, endorsing the KKE proposition to abolish all memorandums between Greece and EU bankers. In May Greek citizens have withdrawn deposits amounting to 3 billion euros. 04.06. Officials of SYRIZA, the ruling party, say that they can't accept the proposed last minute agreement by Greek's lenders. 07.06. On the agenda of the G7 leaders meeting in Germany is the Greek debt crisis. 11.06. Resetting the Greek state radio and television, ERT, two years after its closure by the Samaras government. 15.06. Greece and lenders harden their position after the failure of negotiations to avoid bankruptcy of Greece. 19.06. The European Central Bank (ECB) increased by € 1.1 billion the ceiling for the funding of Greek banks up to 84.1 billion euros. 21.06. Alexis Tsipras presents a new proposal to European partners, including three rates of VAT. 24.06. Theodorakis calls on Tsipras to not sign bad Deal. Same day After talks lasting less than an hour, the Eurogroup interrupts the talks. The participants await an agreement between Greece and the "Institutions" next day, if the talks will resume. 26.-27.06. After a failure to pay a debt to the IMF, Alexis Tsipras announces his will to submit by referendum the proposals of creditors to the Greek people. 28.06. The Greek Parliament votes with 178 against 120 voices for the government's proposal to hold a referendum on July 5. Greece announces the closure of banks and of Athens' Stock Exchange. Cash withdrawal from ATMs is limited to 60 € per day. 30.06. Greece is in default of payment of 1.6 billion € to the IMF. 01.07. A. Tsipras sends a letter to the lenders stating that it will accept a new program under certain conditions. 05.07. Greeks voted overwhelmingly in a referendum against these conditions (61.3% of OXI) .The head of ND, Antonis Samaras, resigns, and so does Finance Minister, Yanis Varoufakis. He is replaced by Euclid Tsakalotos. 08.07. The EU sets the deadline of July 10 to the Greek government to present a new proposal, which be discussed at an extraordinary summit, on Sunday 13. 10.07. According to the Greek proposal, the retirement age should increase to 67 years and those who retire at 62 will have a pension reduced by 15%. 11.07. Greek Parliament approves the new economic measures against the debt crisis. 13.07. After 17 hours of discussion, an agreement was reached between Greece and the Eurogroup. This agreement is very harsh for the Greek people. 15.07. Mikis Theodorakis calls for "the creation of a new movement EAM" (National Liberation Front - the great movement of the resistance linked to Greek PC during the 1940s). During the night, the Greek assembly votes a series of measures demanded by creditors. 39 MPs of SYRIZA vote against. 17.07. Faced with the opposition of some of Syriza MPs and some of his ministers, Tsipras reshuffles his government. After the payment of emergency aid, Greece has been able to repay the IMF. 20.07. Greece is out of the state of "technical bankruptcy" after paying the buying back to the IMF. Greek banks reopen. 22.07. The Greek Parliament approves an emergency bill on measures agreed at the summit held in Brussels on July 13. 36 members of SYRIZA vote against it. 27.07. The Mayor of the municipality Apokoronas, Mr Charalambos Koukianakis, informes Theodorakis of the decision to rename the municipal theater Emprosnero "Theatre Mikis Theodorakis". 27.- 31.07. The second program 103.7 of the Greek Radio celebrates the 90 years of Theodorakis by specials, interviews, concerts, tributes, unreleased recordings, rare footage from its archives. 28.07. Theodorakis' wife Myrto is transferred for five days to the hospital to undergo exams. 29.07. Mikis Theodorakis, who doesn't feel well, celebrates almost alone his 90th anniversary. The same day, Theodorakis, in a dramatic appeal co-signed by a great number of politicians, economists and cultural workers, calls to respect the NO-vote of 5 July. 03.08. The Athens Stock Exchange plunges 22.8% as it reopens after a five-week shutdown. 07.08. Kostas Virvos, the well-known Greek folk songwriter and lyricist passed away at the age of 89, after suffering from serious health problems and a severe stroke. 11.08. Greece finds an agreement with its creditors for a third plan of help. 13.08. Greek economy grows faster than the UK and US in the second quarter, though data suggest this was driven by a significant fall in prices. 14.08. PM Tsipras is confronted to a widening rebellion within his Syriza party as parliament votes to approve the country's third financial rescue in five years by foreign creditors. 222 MPs vote "Yes", 64 vote "No" and 11 abstained. More than 40 SYRIZA members, including Parliament President Zoe Konstantopoulou and former Finance Minister Yanis Varoufakis, vote against the three-year bailout agreement. The same Evening finance Ministers of the 19 eurozone countries agree to €86bn of fresh bailout loans for Greece. 17.08. Athens has formalized the sale of 14 regional airports to the German consortium Fraport-Slentel for 1.23 billion euros. This is the first privatization by the government of Alexis Tsipras. 19.08. After Spain and Austria, the German Bundestag has approved Wednesday morning the third plan of aid to Greece, which may reach 86 billion euros over three years, by 454 votes out of 585. 20.08. Greek Prime Minister Alexis Tsipras resigns and proposes calling an early general election on September 20. 20.08. Myrto Theodorakis is again at the hospital. She suffers from pneumonia. 21.08. SYRIZA has split in two, and a new party has been created called LAE (People's Union). Its president is Panagiotis Lafazanis and the number of deputies are 25 for now. As newspapers announce, Mikis Theodorakis was asked to play an important role. 25.08. In an "Open letter", Mikis Theodorakis tells Mr Panagiotis Lafazanis that those who want to fight against "the system" from inside, will become "system" themselves. He asks him to join "the Popular Front which today upholds the dignity of our people". - Mr Lafazanis answers the next day, writing that the presence of his "Popular Union" in Parliament is not incompatible with its presence in the Popular Front. "I will not become Tsipras", he says. 27.08. Vassiliki Thanou-Christophilou, President of the Court of Cassation, one of Greece's three supreme courts, is newly sworn-in and Greece's first ever female Prime Minister. 28.08. The caretaker government is sworn in at 1 p.m.. Among the ministers are Petros Molyviatis, Foreign Minister; Spyros Flogaitis, Alternate Minister of European Affairs; Giorgos Chouliarakis, Finance Minister; Tryfon Alexiadis, Alternate Finance Minister; Ioannis Giangos, National Defence Minister; Antonis Manitakis, Interior Minister; Antonis Makrydimitris, Alternate Minister for Civil Protection; Ioannis Mouzalas, Alternate Minister of Migration Policy. 04.09. Greece’s former finance minister Yanis Varoufakis said that he will not support SYRIZA and Alexis Tsipras in the upcoming elections, but he hopes they will remain friends. 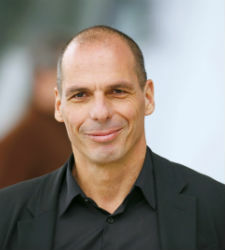 Speaking to CNBC on Friday morning, Varoufakis said he doesn’t believe in the third bailout program Greece has signed and he cannot support the party that signed the deal. “I can’t look my voters in the eyes and tell them to support a failed policy,” he said. 20.09. Against all predictions, Tsipras and Syriza win the early elections with 35.46% of the vote and 145 seats. They are ahead of their rival ND and Evangelos Maïmarakis (28.10% of the votes, 75 seats). Dissidents of Syriza (Popular Union, LAE) remain under the required 3% and do not return to Parliament. On the same evening, Tsipras says he will continue the coalition with AN.EL of Panos Kammenos (10 seats). Abstention exceeds 43%. Mikis Theodorakis refrains from any public comment on the issue of the elections. 28.09. Mikis suffers from a new pneumonia. 05.10. The new Parliament session opens. Nikos Voutsis, founding member of Syriza and former interior minister, is elected President of the Parliament. The Prime Minister makes his speech on his policy, a policy that is largely framed by the conditions claimed by creditors on the third aid package to Greece. Greece’s outspoken former finance minister Yanis Varoufakis said that he will not support SYRIZA and Alexis Tsipras in the upcoming elections, but he hopes they will remain friends. Speaking to CNBC on Friday morning, Varoufakis said he doesn’t believe in the third bailout program Greece has signed and he cannot support the party that signed the deal. “I can’t look my voters in the eyes and tell them to support a failed policy,” he said. 08.10. The coalition government of Prime Minister Alexis Tsipras wins a confidence vote in the Greek parliament, with 155 lawmakers voting in favour and 144 against it during a roll call vote in the early hours of Thursday, which concludes a three-day debate.